One of the interesting questions hanging over the market’s head in recent years is whether the coming surge in apartment construction would derail the market over all. Some people were even saying that apartment construction was Australia’s Lehman moment. That the growing glut would crush rents and prices in the unit market, and this would then spread to the rest of the housing market, as returns everywhere fell and over-leveraged investors headed for the exits. I was never such a worry-wart, but I have been watching it closely. The risks are definitely building and you’d be a fool to ignore them. I’ve also been ringing alarm bells on the high-rise unit market for a while. There is a massive amount of supply either fresh off the boat or in train right now, and it’s hard to see demand keeping up with supply in the short-term. As I predicted back then, we’re already seeing discounting kicking in, and rents seem to be falling in some segments. However, my theory was that any fall-out would likely be contained to the apartment market. In my mind, an inner-city shoe box (which a lot of them are!) is no substitute for a family home in the suburbs. I don’t think anyone really wants to raise a family in a 2-bedroom unit. Not if they had the choice. And so when I looked at it, I saw two distinct markets. There were high-rise units and then there was detached houses. And for me, it was totally feasible that they could end up marching to totally different tunes. And I don’t like to toot my own horn here (though I do seem to make a habit of it don’t I? ), but it does seem that the data is bearing this theory out. We’re getting two different marches to two different tunes. The bellwether (canary-in-the-coal-mine?) here is Brisbane. That’s where unit construction (relative to the existing housing stock) has been greatest. This is where you’d expect to see any fallout from a high-rise glut being felt first. This chart here comes from the RBA’s Financial Stability Review. 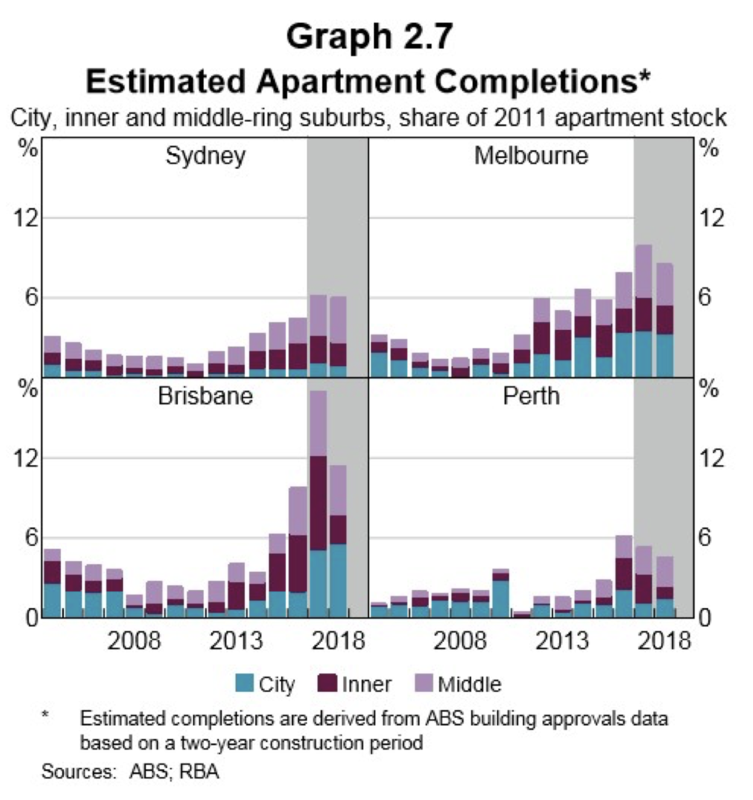 It shows just how large the apartment boom has been in Brisbane, even relative to Sydney and Melbourne. You can see that it’s been huge. You can also see that we’re not done yet, with a fairly huge amount of supply coming on line in 2018 and 2019. So that’s why I’m looking to Brisbane first for the first sign of symptoms. And it is true that the vacancy rate in Brisbane is trending upwards – that means more properties are empty, and that puts downward pressure on rents. Looking at the chart, it’s not panic stations yet. Far from it. But that extra supply coming online isn’t going to help matters. But the real question is, where are these vacancies showing up? If it’s all in the apartment segment – if it’s all one-bedroom shoeboxes – then we should see rents and capital prices for detached houses (even townhouses) hold up. This looks at price growth for apartments and houses in the big capitals. It’s “6-month annualised” which means we’re focusing in on more recent trends. In both cases, apartment prices are falling, at around similar clips. 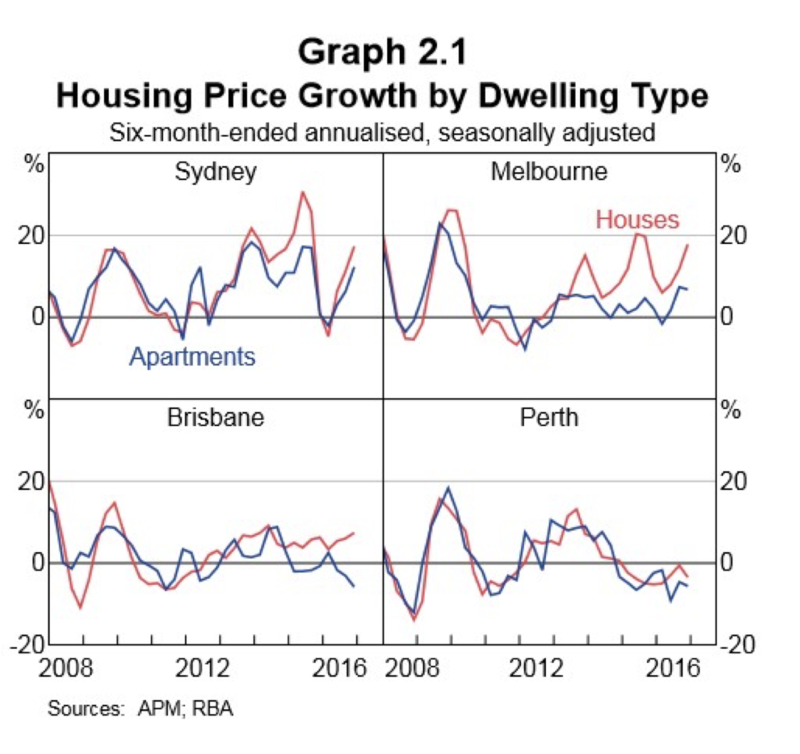 However the difference here is that detached house prices are still growing in Brisbane, while they’re falling in Perth. For me this is clear evidence of the dynamic I’m talking about. In Perth, property price falls are driven by a broad economic weakness, as the state comes to grips with the unwinding mining boom and population outflows. These broad macro-trends are affecting houses and units equally. But in Brisbane it’s a different story. The economy remains supportive to the market overall, and detached house prices continue to grow. However you can see the affect of the high-rise glut, as unit prices start to fall. So it really looks like two different marches to two different tunes in Brisbane. The apartment glut is hurting apartment prices (and even then, that may be contained to inner-city high-rises). And, so far, we’re not seeing any bleed-over into the detached housing market. So far, it seems, the detached housing market remains insulated to what’s going on in the apartment segment. That’s not to say that there’s no risk of contamination. But it’s not going to be direct. It’s going to be through developer collapses and banking system weaknesses. But so far the risk of that seems small. So there’s some good news here for the property market over all. We have been building a tonne of new high-rise apartment stock across the country, but the early evidence suggests that it shouldn’t affect the market over all. We can put that risk to the back of our watch-list for now. 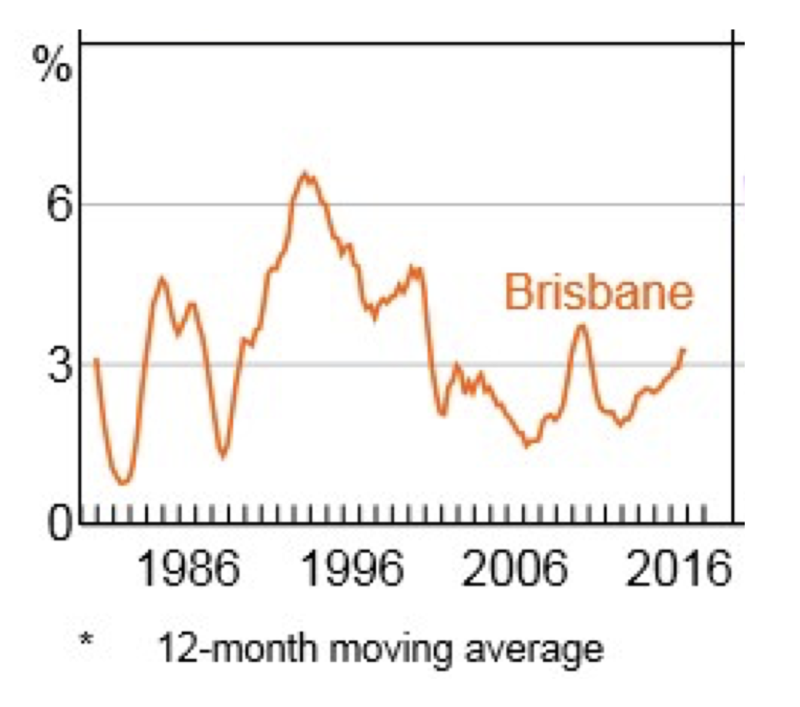 Any Brisbane investors out there feeling affected by the high-rise dynamics?